Are there hacks for Battlefield 5? Yes. Aimbots, Wallhacks, Radar Cheats and similar cheating software are possible to use in the PC, PS4 and Xbox One versions of BF5. Such cheating software may be downloaded for free, as a paid subscription or may come in the form of modded lobbies and servers for console players. However, there are no cheats, trainers or other tools for unlimited Company Coins, all unlocks or unlimited Battlefield Currency/Coins. 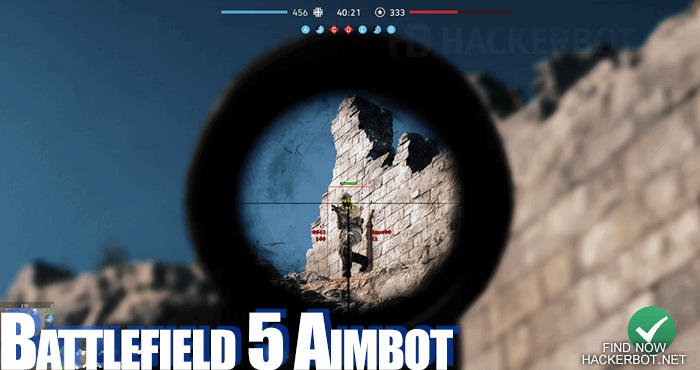 Aimbots are the most powerful and arguably the most sought-after cheat for BF5, allowing you to automatically lock your aim onto enemy players in sight, killing them at the push of a button. A good Battlefield 5 Aimbot will allow you to rack up tons of kills and score in any infantry or vehicle based map, unlock a lot of skins and weapons quickly and farm those juicy Company Coins and fancy weapon skins quickly. However, aim bots and similar auto aiming tools are extremely easy for other players to notice and report if used without respect for other players, resulting in bans. EA / Dice have also deplayed the FairFight anti-cheat that detects cheaters through statistics analysis. So if you do not want to get banned while using an aimbot in BF5, you will want to only turn it on some of the time and when you use it, you will want to use it carefully and with respect for other players or you will get banned. Overall, aimbots may be the most potent cheat available in online shooters as a whole and multiplayer games as a whole, but they do rob the game of your sense of achievement by making skill irrelevant. If you want to find BF5 aimbots, use this method to find legit downloads. Seeing through walls is a pretty handy tool to have in online multiplayer shooters and Battlefield 5 is no exception here. VAC, ESP, Wall hacks the ‘seeing through walls’ cheat has gone by many names, but has always been one of the most popular because of its ability to make any shooter a lot easier without taking away your sense of skill completely and making the game a lot less boring than auto aiming apps. 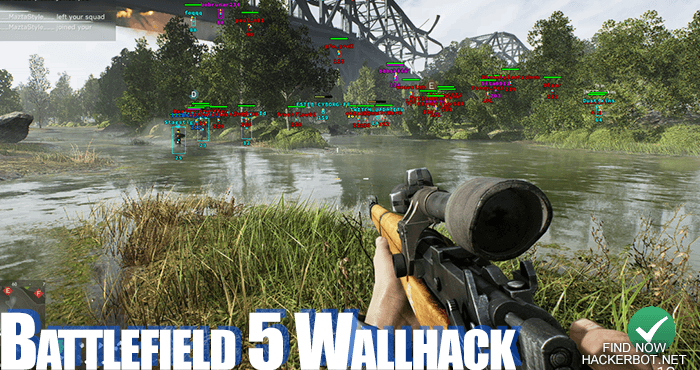 A quality Battlefield 5 Wallhack will allow you to see enemies through walls using colored boxes or skeletons, will show you their health, class, their distance, will highlight explosives, ammo, health and other pickups, will show you vehicles and will warn you if an enemy player is aiming at you. We do recommend the use of ESP cheats over the use of auto aim, for the sake of having fun in BG5 and for the sake of keeping your account safe. FairFight and other statistics-based anti-cheats cannot detect wallhacks, but players will still be able to tell if you ware wallhacking if you are prefiring corners, watching walls all the time ect. However with the directional sound in Battlefield 5 being as good as it is, it is a lot more plausible when you see enemies through walls. However, you should never try to shoot through walls and headshot people no matter how tempting it may be. Such action will give you away as being a cheater right away. Game hacks and cheats are tools and nothing more. A tool is only as good or bad as the player using the tool. In general, Battlefield 5 hacks will allow you to farm XP, unlock and CCs a lot quicker and make the game a lot less of a grind. However, if you want to have fun with the game, you might want to play without cheats after you have unlocked every gun and every skin you want. Especially because of the kind of anti-cheating software that DICE and EA have implemented in BF5: Your risk of getting your account banned goes up the longer you use cheating software, especially on PC. We don’t know the exact situation on PlayStation 4 and Xbox One servers, because those consoles have never had a huge game hacking problem. Good aimbots should be able to correct for bullet drop on every gun, every vehicle, tank and plane in the game. This should also be the case for special vehicles, such as the Sturmtiger and Churchill Crocodile Tank, which you will be able to call in a lot if you are using cheats and leading a squad. Hacks are also a lot more powerful in Battlefield 5 compared to other BF titles in the past, since the time to kill is significantly faster this time around and the netcode seems to work a lot better and register hits a lot more accurately. However, it still plays to have low ping when playing BF5 with hacks too. Finding free downloads when it comes to BF5 wallhacks and aimbots may be difficult, since these openly accessible files are often banned within days. 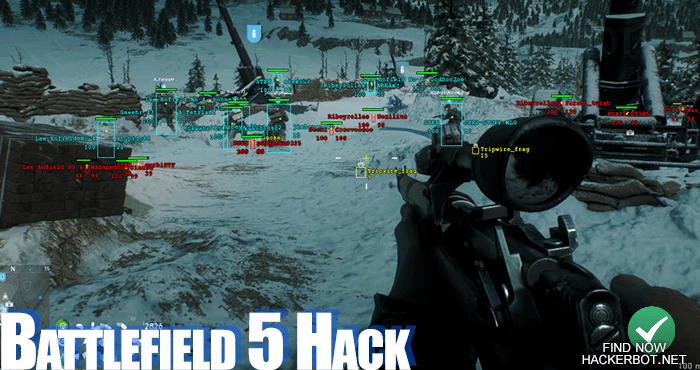 EA DICE has proven for many years that they are very good about blacklisting free hacks pretty swiftly after they are posted and a lot of game hacking communities are quite aware of that at this time as well. So if you are going to try and find free cheats Battlefield 5, we recommend that you use this tool and follow the Download guidelines very strictly or you will risk your account getting banned before you even get to use any kind of cheats. You must make sure that the files you are about to download are clean, undetected and working at the time of use. Console players of BF5 can use the same tool to find cheats. However, finding working ways to gain the technological advantage, so to speak, has always been a lot harder in the latest gen consoles, such as the PS4 and Xbox One. The best thing to hope for is that there will be hacked servers for BF5 available or that actual wallhacks and aimbots can be executed on hacked version of the current generation consoles. While it would be nice to have really overpowered hacks for Battlefield 5, such as a working God Mode (unlimited health), ammo, unlimited XP and Score, all unlocks and skins, gold weapons, infinite company coins, battlefield currency and a rainbow pony of top. 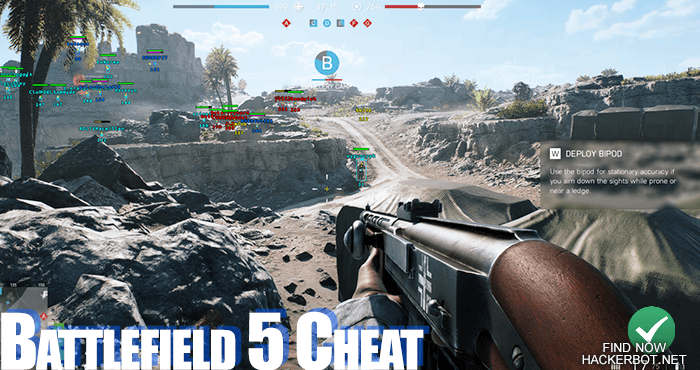 – However, BF5 is an online FPS game and all your precious account data is stored on the EA / DICE servers that cannot be modded, hacked or edited in any way. So the only way to get exclusive premium skins and items is to pay and the only way to unlock stuff and Company Coins is to play the actual game leveling up weapons will also require you to play the game and get some kills too. - So enjoy playing the game. Modded controllers are the most popular kind of cheat for PS4 and Xbox One Consoles: They are actual controllers that have been electronically modified to act as a script or macro or sorts allowing the player to hold down the trigger and the controller either tap shooting and recoil correcting or turning full auto shooting with or without recoil correction. The power of the controller mod cheat is insane, allowing you to turn almost any gun into a full auto monster and making any gun more accurate when taking multiple shots through the configurable recoil correction. The downside of this method of gaining an advantage in Battlefield 5 is that configuring the modded controller can be really difficult if no premade profiles are available. Ever gun will need its own profile, but most good modded controllers with let you switch between at least 20 profiles at once. Overall, modded controllers are probably the most popular hack for BF5 on console. 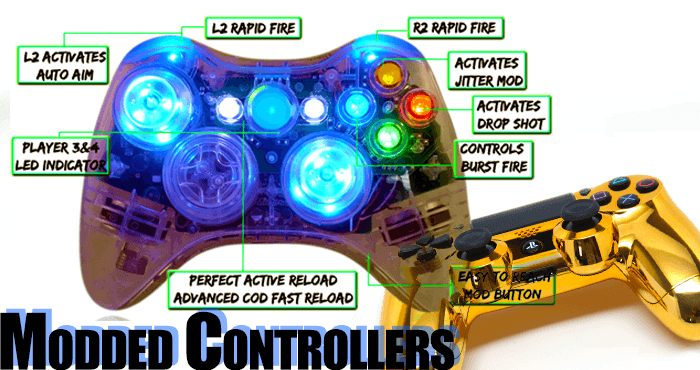 Learn more about modded controllers.